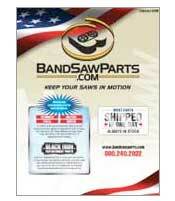 Bandsawparts.com is an aftermarket parts supplier. All use of Original Equipment Manufacturers Names and Part Numbers is for reference only. We are not affiliated with any Original Equipment Manufacturers.